Thinly-sliced, these are an excellent substitute for the kaffir lime leaves. Kaffir lime peel is also indispensable when making your own Thai curry paste. Kaffir lime peel is loaded with a fragrant citrus oil, and the flavor of the fruit is overwhelming if eaten fresh. The kaffir lime tree is grown and harvested mainly for the leaves which are a staple in Thai cooking, but the tree doesn't produce many of these limes. As kaffir limes aren't eaten fresh, and there's limited use for them, our grower typically strips the trees of all fruit each year to promote growth of the leaves. This year however we kept fruit on a few trees and now it's been harvested. The fruit not only looks excellent but the culinary appeal is perfect: fragrant, strong citrus flavor. Put a slice of the bitter peel in your mouth and your lips get a tingling sensation of citrus unlike anything you've tasted. Kaffir lime peel is used to make Thai curry paste, by pounding it together with other ingredients in a mortar and pestle. Notice from the pictures the nice thick, white fleshy peel. This is loaded with citrus flavor and aroma. A classic Thai dish that uses kaffir limes, whole, in soup is Khanom Jin. It's also used to make candy. Kaffir limes are used extensively in aromatherapy. Some massage oils, natural shampoos, and various herbal products call for kaffir limes but the scarcity of this fruit makes it difficult to prepare authentic versions. Thinly-sliced, these are an excellent substitute for the kaffir lime leaves. If you are concerned about delivery date and please call us toll free 1-888-618-8424 to discuss. 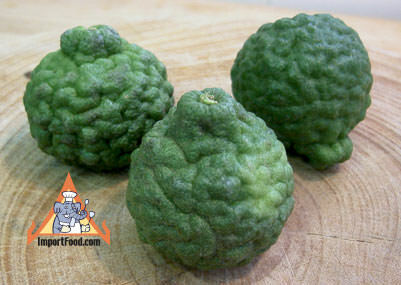 More information about kaffir lime fruit here. Each lime is approx 1-1.5" diameter, and weighs 1 oz. We'll ship your fresh limes separately via USPS Priority Mail, upgrading to 2 day service at no extra charge. Grown in USA. Please Note: Fresh kaffir limes ships via USPS Priority Mail so please provide an address that can be used for USPS delivery. If you order only fresh produce, select "$0.00" as shipping charge at checkout (because the price above includes express shipping). If you order fresh produce and any other items, you must checkout with "UPS Ground" as the shipping method, and you will receive the other items separately. Occasional delays due to Mother Nature & harvest conditions. Any questions about shipping, if you need a definite delivery date, delivery times, or anything else please feel free to call toll free 888-618-THAI. This recipe highlights the delicious Thai mini eggplant and it's a common recipe throughout all provinces of Thailand. The advantage of this recipe is that you pound fresh chiles into a high quality green curry paste, resulting in a more bold, fragrant and spicy final result. We also have another recipe for gaeng khiao wan gai.